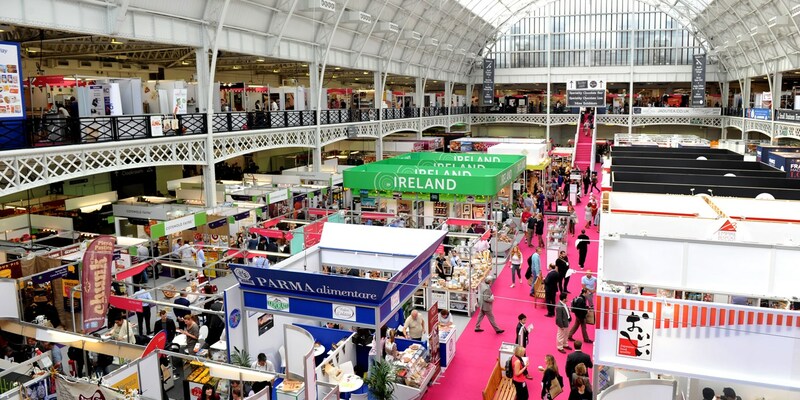 Blogger and all-round foodie Felicity Spector sampled the delights on offer at the Speciality and Fine Foods Fair in London, and after much deliberation, has given us her top picks to look out for. 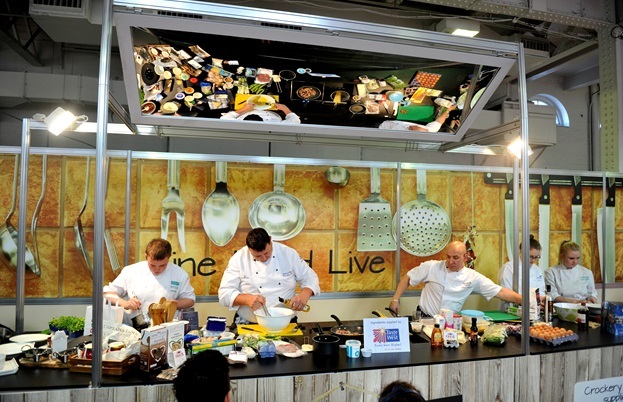 From chocolates and cheeses to juices and jams: the vast annual trade show, Speciality and Fine Foods, is the country's biggest showcase for small producers to show off the kind of food that will be coming soon, to a deli near you. Along with some familiar household names, there's a whole host of new ones - so I've picked out some of the most delicious and the most unusual - for my Best in Show. There can never be too much salted caramel. Especially if it's three star gold Great Taste award winning salted caramel from Ireland's Cloudberry Bakery. They've now pushed the bar still higher, with two new chocolate spreads, one spiked with fennel pollen, another with orange. Deep, rich, good enough to eat straight from the spoon. For another incredible range of toast-toppings: try Helt honey, hand made in Denmark with beautifully designed packaging. Their honeys come flavoured with all sorts of fruits and spices, from cardamom to hazelnut. Peanut butter is having a moment: and Yorkshire based Proper Nutty have created an outstanding one. The longer roast gives it a beautifully rich and deep flavour, and is ground to what they call a 'smunchy' texture, mid way between smooth and crunchy. Or for something more savoury - a range of Moorish smoked dips is already available in Waitrose, including three kinds of hummus and a smoky aubergine babaganoush. They've got some fantastic new recipes coming next, all using British rapeseed oil, including a dip made from peas which is beautifully smooth and fresh. If you're looking for an alternative to smoked salmon - try another three star gold winner: Gigha Halibut. This succulent, delicate smoked fish hails from the Hebrides, but you can find it rather nearer to hand in a number of leading food halls and delis, and online. Vegetable crisps always seem healthier than regular crisps. They're vegetables, right? For the best of British produce - try Scrubby's Veg crisps from Lincolnshire, or all the way from North Carolina, Scott Farms' multicoloured sweet potato crisps are hard to beat. East Lothian artisan company The Pea Green Boat has come up with another outstanding savoury snack: buttery cheese sables that melt in the mouth. They come in three flavours - original, cumin and fennel with chilli. For something more substantial – Morso Food has created three risottos you can reheat at home, without turning into a gloopy mess. Best cooked in a pan with a touch of water, with as much butter as you dare stirred in at the end: they've come up with proper, well flavoured risottos you can bring to the table in less than five minutes. La Tua pasta are well known for their innovative filled pastas, and they've come up with many more. There's a pumpkin chestnut tortelli, a Christmas one with goat's cheese and cranberry, and even some sweet gnocchi stuffed with apple and raisin. In a crowded preserves market, the Artisan Kitchen once again stand out for the vibrancy and beautiful flavour of their jams, while Radnor preserves have come up with some really creative ideas, like a smoked marmalade which goes perfectly with cold meat or cheese. And for breakfast - the award winning Spoon Cereals with their cinnamon pecan or apple peanut granolas are now available more widely, via Ocado. An unexpected find was the magnificent layered cinnamon cake by Sokeh Food, a traditional Dutch creation which combined thin layers of moist sponge with buttercream to create a very moreish dessert. They're hoping to find some UK suppliers soon, so keep your eyes peeled. 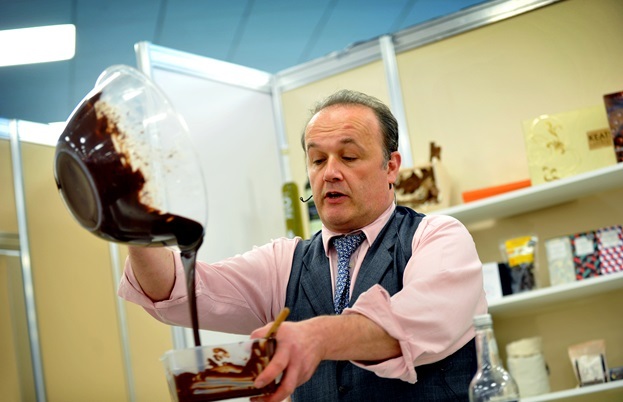 At the special section of the show dedicated to chocolate there were, as usual, a host of excellent producers. Most impressive was Matthieu de Gottal, who's only been making chocolates for a few months but has already been showered with awards, and quite rightly: his truffles and ganache filled chocolates were outstanding. Another find was the Shoreditch based Paxton Chocolate: Caitlin Paxton's Parisian training really shows in her beautifully made thins, with new seasonal flavours like chestnut and vanilla, and winter spiced apple. New east London business, Eat Chic, have come up with a fabulous collection of nut butter cups, enrobed in Montezuma milk, white and dark chocolate with fillings like cinnamon almond butter and peanut butter with raspberry jam. You'll never want a Reese's again. And Harry Specter (no relation) have come up with a fabulous range of beautifully decorated chocolates from their base in Cambridge. They're a social enterprise firm, offering employment opportunities to young people with autism, and the quality of their work is a real tribute.